The Smithsonian Institution is truly an American treasure. Composed of 19 museums, nine research centers, and a zoo, the Smithsonian is the world’s largest museum and research complex. It is part of the federal government but is not housed within one of the three branches of government. 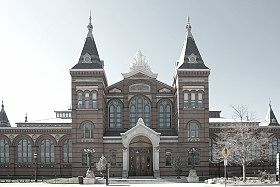 Several years after James Smithson bequeathed his estate for establishment of an institution to bear his name, Congress passed legislation to set up a trust for the Smithsonian Institution. More than 6,000 people work for the Smithsonian Institution. Jim Douglas leads the human resources office that serves those workers. According to Douglas, the Institution’s mission resonates with him and the rest of the Smithsonian’s workforce. Michael Roberts: The mission of the Smithsonian Institution is “the increase and diffusion of knowledge.” Its vision is “shaping the future by preserving our heritage, discovering new knowledge, and sharing our resources with the world.” How does the Smithsonian operationalize this mission and vision? Jim Douglas, Human Resources Director for the Smithsonian Institution: The Smithsonian seeks out a diverse workforce that reflects the American story we share with our visitors every day through our museums and educational initiatives. MR: There must be a wide variety of jobs people can do for the Smithsonian. What are some of the more common positions found at the Smithsonian, and what do those jobs entail? JD: There are literally hundreds of occupations at the Smithsonian ranging from animal keepers to astrophysicists, from security officers to utility system repair operators, from anthropologists to art historians. We have lawyers, veterinarians, museum specialists, game wardens and on and on. MR: Those certainly are some diverse options. As students prepare themselves for possible careers with the Smithsonian, which degrees to should they pursue? JD: Because of the breadth of jobs at the Institution, there is no one degree to pursue as we seek applicants in a wide variety of occupations. MR: The Smithsonian has a number of fellowship and internship opportunities. One thing people look for in such opportunities is the chance to turn a temporary assignment into a bona fide job. Do people often make the transition from a fellowship or internship to permanent employment with the agency? JD: About two-thirds of our six thousand positions are federal civil service positions. These require applicants to apply and be selected based on merit principles. While some interns and fellows move into regular Smithsonian positions, most are filled through open competition. One federal program that does allow interns and recent graduates directly into full-time federal positions is called Pathways. MR: The Smithsonian appears a bit unique when it comes to funding its personnel costs. There are federal jobs and what you call trust positions. How are those two different? JD: Those positions funded by direct federal appropriations are considered to be in the federal civil service, and the hiring processes promulgated by the U.S. Office of Personnel Management are followed by the Smithsonian in filling these positions. About one-third of our positions are funded by sources other than direct federal appropriations such as revenue from our business activities, grants and contracts, charitable donations and even funds derived from the original bequest to the United States by James Smithson in the early 19th century. Our trust positions are not in the federal civil service, but we try to parallel the salaries and benefits somewhat equitably. MR: The Smithsonian has so many specialized positions. It would seem like an employee could find a niche and stay in it for a long time. How long do people typically stay with the agency? JD: It varies, but we have many individuals who have devoted their entire careers to the Smithsonian. These are often found in the curatorial fields where many of our employees are the experts in their fields. A number are productive members of the staff who have been here over 50 years. We also have a number of individuals who have retired but maintain an emeritus status and who continue to contribute in their field of expertise. They often act as valued mentors to those coming through the ranks. MR: As you know, the Best Places to Work in the Federal Government is an employee satisfaction survey administered annually to federal employees. In the 2013 rankings, the Smithsonian Institution placed as the second best mid-size agency. To what do you attribute this strong showing? JD: People feel they can make a positive contribution. The Smithsonian is a learning institution, and each and every employee understands that they play a role in fulfilling our mission of conducting research, educating the public through personal visits to our museums as well as digitally around the world. MR: I’d like to shift from talking about the Smithsonian as a whole to discussing your story. Those who are new to public service can take a measure of confidence in looking to someone who has successfully made a career in government work. Professionally speaking, how did you get to where you are now? JD: After graduate school, I moved to Washington, DC, and found a job in a federal agency, first as a management analyst and later in the field of labor relations. I moved to the Smithsonian and eventually went to law school at night and transitioned into the Smithsonian Office of General Counsel, rising to be Deputy General Counsel for a number of years. I then changed careers and became head of human resources for the Institution where I am presently. MR: You have spent more than three decades of your career with the Smithsonian. What has kept you with the agency for so long? JD: I like learning about eclectic topics, so what better place to be? Further, I have many smart and interesting colleagues with whom I work every day. And the mission of the Smithsonian -- increasing and diffusing knowledge to the world -- resonates with me. MR: Finally, what advice do you have for someone considering a career in public service? JD: It is fulfilling to know that you have made an effort, and hopefully a difference, to improve the lives of others. Do You Have What It Takes to Be a Food Inspector? What Does a School Principal Do?